Juliette is unable to touch anyone without killing them. She has been locked in an insane asylum for 264 days, and has not seen or spoken to anyone in just as long. While she is locked away for possessing an ability that nobody understands, the world is crumbling around her. The Reestablishment has taken over, claiming that they will be able to stop the diseases that are spreading, find food for everyone, and bring the world back to the way it was. When they come to get her from her cell and tell her they are going to train her to become a weapon, Juliette realizes she has to decide between being used or fighting back. I seriously don’t know why it has taken me so long to read this series. On the one hand I’m mad because I could’ve been enjoying these books for years now, but on the other I’m glad I waited because I was able to read through the entire series in two days now that the final book was just released. Either way, I am so happy I finally picked this series up! Juliette has basically lived a tortured life. Her own parents thought she was cursed and were only too happy to hand her over to the asylum when she accidentally killed someone with her touch. She hasn’t been touched by anyone or received any kind of affection from anyone ever. She has grown up lonely and depressed, without any real friends. When the Reestablishment comes to get her they expect to find an insane monster, but instead they find a lonely girl with no desire to harm anyone. Juliette is taken to the headquarters of Sector 45, where she is introduced to Warner, the sector leader who is quite obsessed with her and her ability. He wants to train her to be a weapon, so that the Reestablishment can use her power. Juliette wants anything but this. She has never had any desire to hurt anyone, and the idea of being used as a weapon is the kind of thing she has been trying to stop people from thinking her whole life. Plus, she is distracted by Adam, the soldier Warner put in charge of her, who seems to be on her side. I really loved the writing style of this book. The writing is beautiful and I felt like I was right in Juliette’s mind along with her. The book has strike outs throughout, as if Juliette is thinking something and then crossing it out and changing her thoughts. It was such a brilliant way to write a story and really gave Juliette a strong and powerful voice. I was actually really surprised at the pace of this novel. I thought the whole first book would take place in the asylum or even on the military base, but the book progressed much quicker than I expected. I really loved Juliette and I have to say I was definitely intrigued by Warner, even though he seemed like such a monster at times. Overall, Shatter Me was a fast paced, beautifully written dystopian novel that will leave you anxious to read the next book. I highly recommend reading this one if you haven’t yet! 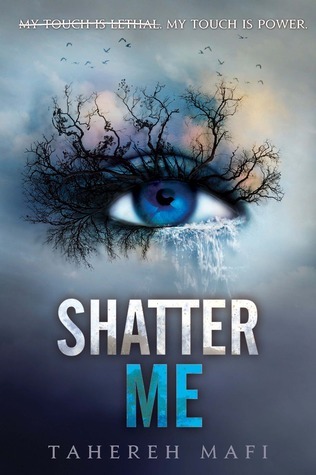 Shatter Me was released on November 15, 2011 and is the first novel in the Shatter Me series.